"It's Monday morning and George walks out the front door to his car and a flat tire. But this is the least of his problems. His home life is in shambles and his team at work is in disarray. With a big new product launch coming up in 2 weeks for the NRG-2000 he has to find a way to get it together or risk losing his marriage and job. Forced to take the bus to work, George meets a unique kind of bus driver and an interesting set of characters (passengers) that over the course of 2 weeks share the 10 rules for the ride of his life... and attempt to help him turn around his work and team and save his job and marriage from an almost inevitable destruction." In the mode of other best selling business fables The Energy Bus, takes listeners on an enlightening and inspiring ride that reveals 10 secrets for approaching life and work with the kind of positive, forward thinking that leads to true accomplishment - at work and at home. Everyone faces challenges. And every person, organization, company and team will have to overcome negativity and adversity to define themselves and create their success. No one goes through life untested and the answer to these tests is positive energy-the kind of positive energy consisting of vision, trust, optimism, enthusiasm, purpose, and spirit that defines great leaders and their teams. Drawing upon his experience and work with thousands of leaders, sales professionals, teams, non-profit organizations, schools, and athletes, Gordon infuses this engaging story with keen insights, actionable strategies and a big dose of positive infectious energy. 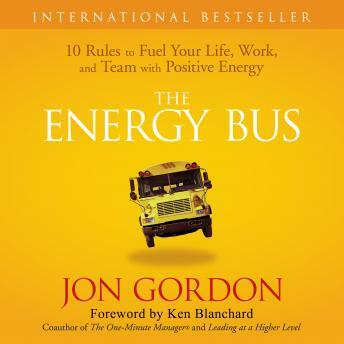 For managers and team leaders or anyone looking to turn negative energy into positive achievement The Energy Bus provides a powerful roadmap to overcome common life and work obstacles and bring out the best in yourself and your team. When you get on The Energy Bus you'll enjoy the ride of your life! Loved this book so much! Easy read with so much relevance and practical tips. Highly recommend it. Great quick read, helps put you back into the right mind frame at work and with your team. Loved this book! I plan to have all of my team read it as well! An amazing read and a great inspiration for those looking to make a change. Great book! It has really helped me on my journey.